I’m happy to say I’ve participated in all of the Dark Horse Series championships since 2010. The cast of characters that make this competition happen and those participating in it never fail to create an atmosphere that I can truly appreciate. It’s Boston, where there’s a passion for the sport, and climbers push fellow climbers to do their best. 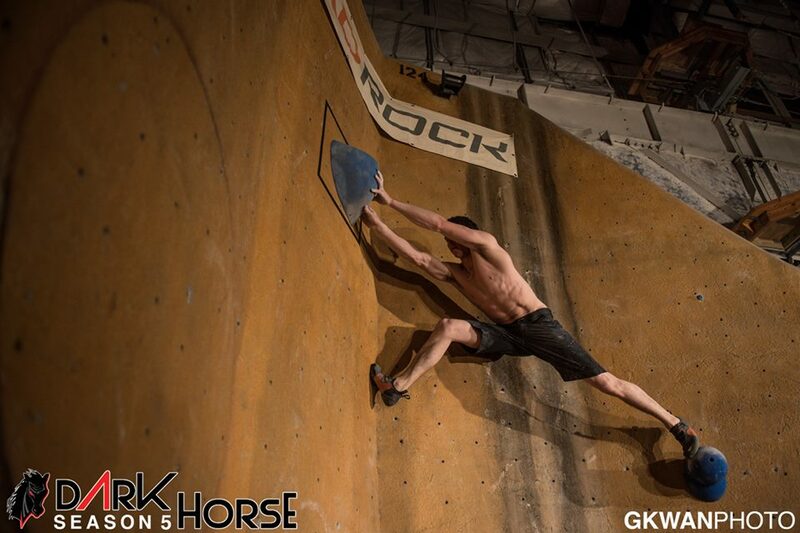 I made it through the three-hour qualifying round climbing alongside friends from around the country: Stephen Meinhold, Vasya Vorotnikov, Mike O’Rourke, and Peter Dixon – among others. Going into finals, banking from experience, I prepare for problem one to be a ninja-warrior type challenge, followed by three problems that test gamut of a competitor’s skills. From iso I’m escorted to chair #1, amid a full house packed to the gills, their toes crossing the line that divides safety and the landing zone. Spectators are set underneath an amphitheater – a lead wall – and they’re already loud to begin with. In the next 35 minutes, they provide the intensity I need to climb my way to the top of the Dark Horse podium. Being my favorite event of the year, there’s no doubt I’ll return to Boston in 2015 to defend my title!